Buffet Society: Gluttonous goodness at the all-you-can-eat troughs. Who doesn’t love a buffet? I certainly do. It’s not that I’m gluttonous. OK, maybe it is that I’m gluttonous. But what I love about an all-you-can-eat buffet isn’t just the quantity. It’s more that I’m not really an “entrée plus side dish” kind of guy. I prefer to eat small portions of a lot of things, rather than big portions of a couple of things. Thus, my tender feelings toward buffets. I love ’em all: big ones, small ones, fancy ones and cheap ones. Even at the most bogus buffet, you can usually find something to satisfy. At the Crazy Buffet (4150 S. Redwood Road, 801-967-8589), you’ll find a $9.99 buffet featuring wide assortment of Chinese dishes along with breaded and fried fish, macaroni and cheese, steamed shrimp and crab legs, sushi rolls and desserts. The quality of the food varies from excellent lo mein, Mongolian beef and pork potstickers (I ate about six of those dumplings myself) to so-so spaghetti, french fries and crab salad. I recommend avoiding the fried foods at Crazy Buffet (fish, chicken, octopus, french fries), which taste like they were all cooked in the same tub of overused oil. At the opposite end of the buffet spectrum is the Sunday brunch buffet ($42 adults/$25 kids) at Stein Eriksen Lodge (777 Stein Way, Deer Valley, 435-645-6455, SteinLodge.com). Once you’ve experienced this ultra-deluxe buffet, nothing else quite stacks up. You probably already know about the bodacious seafood selection, which is worth the asking price alone. The smoked oysters are freakin’ fabulous. And of course there are freshly roasted meats and poultry at the carving station, custom-prepared omelets, the best waffles in America, Raymond Lammers’ spectacular desserts and live music, just to name a handful of Stein’s buffet attractions. But what really sets this dining scene apart from others is the uber-professional service staff. Oh, that and the 10,000 bottles of wine to select from at brunch. Frankly, though, I’m not really much of a brunch person. So my favorite buffet is Deer Valley Resort’s Seafood Buffet ($62 Adults/$34 Kids). DV’s Seafood Buffet operates during the ski season, Monday through Saturday. It’s hard for me to get past the mountain of freshly shucked oysters at the Seafood Buffet, but I eventually make my way to the house-smoked salmon, Dungeness crab, tiger shrimp, steamed New Zealand clams and sushi. This season, there’s also a killer Brazilian fish stew on the menu, glazed Muscovy duck breasts, prime rib, yellowfin tuna with wasabi cream, honey & soy-glazed bluenose sea bass with fresh ginger sauce … well, I could go on and on. As at Stein’s, service at Deer Valley is flawless, and Kris Anderson’s wine selection is dazzling. Enviro-correct bonus: Deer Valley goes to great lengths to try to use only sustainable seafood. I know, I know: It’s not exactly gourmet, and it’s frankly a tad embarrassing to admit a fondness for Chuck-A-Rama ($10.99 Adult/75 cents per year of age for kids, Chuck- A-Rama.com). But sometimes, you just have to face the music. True, I try to avoid “Taste of China” Tuesdays at The Chuck. But I have an odd affinity for the Friday Chuck- A-Rama menu, which features Cajun-spiced fish filets, seafood Newburg and shrimp Creole. Of course, every day you can load up on roasted turkey, cornbread, mac & cheese, meatloaf, mashed spuds, chickenfried steak, banana squash, stuffed peppers, homemade rolls and carrot cake. I’ll bet you didn’t know this: There’s a drink you can order called the Suicide. Nope, it’s not a Utah version of a Long Island Iced Tea. It’s a combination of any number of soft-drink choices you care to mix. Another dependable family-style buffet of the Chuck-A-Rama variety is Layton’s Hometown Buffet ($10.99 Adults/$1.99 each for up to 4 kids with a paying adult, 1120 N. Main, Layton, 801-547-9976, Buffet.com). 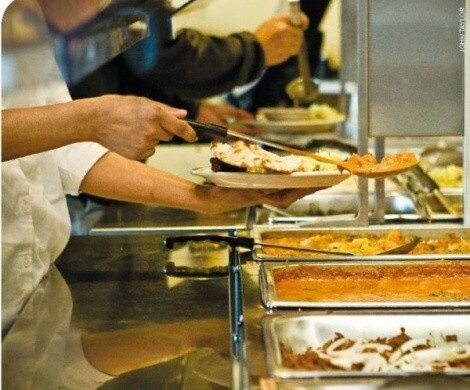 As with Chuck-A-Rama, the Hometown Buffet features daily themed menus in addition to a vast array of everyday items, including damned good home-style macaroni and cheese. So there is Meat Lovers Mondays, which features roast beef and au jus; Italiano Tuesdays with pastas and other Italian-esque dishes; Tex-Mex Wednesdays with a taco bar, fajitas and such; BBQ Thursdays; Seafood Fridays; etc. I confess to being a sucker for fried seafood, which is the only way we ever had it growing up. So the breaded-and-fried shrimp and the battered fish filets at the Hometown Buffet really do remind me of home. Virtually every local Indian restaurant that I’m aware of features a lunch buffet. And frankly, I’ve yet to find one that wasn’t well worth the $5-9 you pay. One of my favorites—and a favorite of other City Weekly staffers—is Ganesh Indian Cuisine ($8.99, 777 E. Ft. Union Blvd., 801-569-3800). The lunch buffet at Ganesh features a bounty of tempting treats for vegetarians and meateaters alike. The offerings change from day to day but you’ll usually find a vegetarian and meat curry, sometimes korma, along with chana dal, tandoori chicken, freshbaked naan, raita, sambar soup, papadum, samosas, masalas, rice pudding and unique Hyderabadi dishes that Ganesh is so popular for. Definitely try the bindi masala (okra and masala sauce) if it’s available. Grand America’s Garden Cafe (555 S. Main, 801-258-6708, GrandAmerica.com) is home to Salt Lake City’s finest Sunday brunch buffet ($38 adult/$19 kids). Frankly, there’s no one else even close: King crab legs, roasted leg of lamb, achiote-roasted pork loin, sushi & sashimi, prime rib, fresh crepes & omelets, paella, a risotto and pasta station … what more could you want? Top it all of with chef Kurtis Baguley’s adventurous array of sweets, including his incredible hand-crafted artisan chocolates. Gluttony is good.